October 2, 1872, Phileas Fogg is asserting that it’s possible to go around the world in 80 days. The gentlemen of the Reform Club have made a bet on his failure, since they don’t believe this eccentric dandy could ever succeed! However, the most troubling part of this story is the strange coincidence between the rash departure of Phileas Fogg, accompanied by his loyal valet Passepartout, and the theft of 50,000 pounds from the Bank of England! The first lady or gentleman to return to London wins the game. However, since you left the British capital suspected of stealing from Her Majesty’s bank, you will have to return to London without any Rumor cards and 10£ or less in your pocket (or rather, in your hand) in order to prove your innocence in the eyes of the world! Players will quickly discover that moving too fast drains their wallet just as fast. To win, you will have to alternate between cautious and ambitious advances, waiting for the right moment to return to the city! 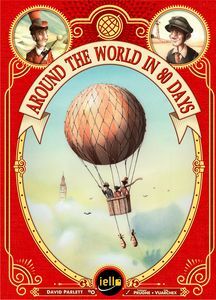 Around the World in 80 Days is a beautiful and modern republication of the first ever Spiel des Jahres winner (the most prestigious Game of the Year award in 1979), thematically revisited around the timeless and beloved novel of the same name by Jules Verne.